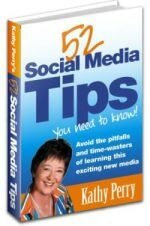 Enjoy Kathy’s 52 Social Media Tips for free – it will provide insights into how to avoid the pitfalls and time wasters of social media marketing. These tips can make a difference in your business in saving you both Time and Money! Download your 52 Social Media Tips immediately. You can use this information NOW! Since implementing some of Kathy’s suggestions I am happy to tell you we have doubled the reach of the TWBAONLINE Community!